There is now a special page dedicated to the BfK Limited Edition Figures project and a link to it has been added to the navigation menu in the header above. This is the place to go for a summary of the genesis, history and progress of the project; the figures themselves and how you can order them from me. Oh yes, it also covers the prize draw and painting guide! Calpe Pack P22: march-attack Prussian musketeers. 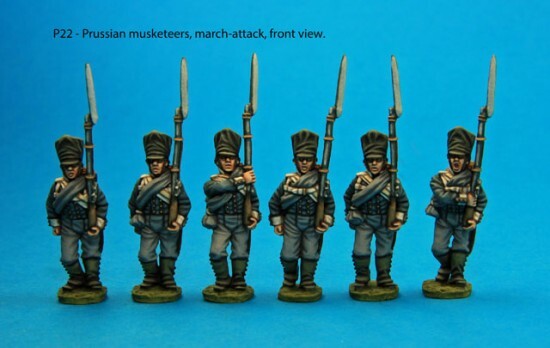 Calpe Pack P23: march-attack Prussian musketeers, head variants. After a hiatus almost as long as mine, the 2014 Calpe Towers release juggernaut is ready to roll. Peter F. has had to content with some rubber-related troubles over the last couple of months (sorry, I couldn’t resist that little double entendre opportunity) because his long standing supplier is no more. After trialling a variety of replacements, you can now expect new packs to start becoming available on the website very soon. Are they French, Prussian or Saxon? The answer is: all three! Finish, the French march-attack set. Finish the Prussian march-attack set. Finish the Saxon advancing set. Finish work on the French gunners. Finish work on the Saxon gunners. Calpe Pack S1: advancing Saxon musketeers with covered shakos. Calpe Pack S2: advancing Saxon musketeers with calfskin shako covers. Calpe Pack S3: advancing Saxon musketeers with uncovered shakos. I think you should see some packs on the website later this week or early next week because Peter has been frantically taking pictures, photoshopping them and writing the blurb to go with the packs. Indeed, some of them already appear to be there! If I’ve got my sums right, there are three Saxon musketeer advancing packs (S1, S2 and S3 – not to be confused with the “old” Saxon packs) and a couple of Prussian musketeer march-attack packs (P22 and P23) already mustered for duty.